Team Members - Praise and Worship Leader Training ... This worship leader podcast is exactly what you need if you want to create the perfect backing band to lead worship with. Wouldn't you like the best band ever behind your worship leading? I know I would, but the pod today discusses what exactly is the perfect band, and the steps you need to take to create it in your church. Is having the perfect band behind you about their abilities, their attitudes, your leadership or the grace of the Holy Spirit? It is probably a bit of all of these, but in the pod we will show you which ones you can compromise on, and which ones are the most important (starting obviously with the Holy Spirit!). If you have a band and singers in your church, this worship leader podcast is not to be missed! And don't forget, it is possible to download lots of pods for free either from this site, or you are able to download free of charge from iTunes, or subscribe to it so you don’t miss any episode ever! Nearly every week there is a special edition of the pod coming at you, so subscribe on iTunes and be a part of our worship leader community. And if you like us, and I hope many of you do, PLEASE LEAVE A REVIEW so iTunes knows that we're helping you along! Whether you are driving to work, mowing the lawn or simply chilling out (maybe with a pleasant cup of tea! ), let us teach you, brighten up your entire day and maximize the use of the time you have for the Lord! Click Here to Subscribe to your Worship Leader Podcast Now! Or type this into your browser: http://www.buzzsprout.com/3378.rss Or, should you be really keen to master more about all aspects of worship leading, from managing your team to arranging your songs, from discovering how to worship lead with a small band to conditioning your voice, plus a bunch of other tips and techniques, take a look at the whole list of Worship Leader Podcasts, so you can listen to all of them!!! OK, it will take you a while, but you will definitely get some ideas about all aspects of worship leading, how to help your voice, manage your band, and a whole host of other things (and also have one or two laughs). Or, save yourself the trouble and buy the Worship in a Nutshell package, to help you get the best information ready to apply now in the church. It costs a small amount, but boy it saves you quite a lot of time learning!!! This worship leader podcast is on a touchy subject, yet it is something you will face sometime for sure... harsh words! It might be anger from a team member, it might be criticism from a congregation member or it might be something said harshly by your senior pastor. Doesn't matter, they all hurt like crazy and can destroy you, your confidence and your ministry if you don't deal with them the right way! This Worship Leader Podcast will help you survive! No one likes to be criticized, and no one likes to be spoken to harshly. But it will happen, so get prepared. The old saying says, "Sticks and stones may break my bones but words will never hurt me," and it is simply not true. Words can hurt you far more than sticks and stones, and the scars can last a lifetime! You cannot stop the harsh words, but what you can do it protect yourself against their venom and make sure that, while they may still hurt, you are not destroyed by them! Your ministry before the Lord is too precious to have it destroyed by somebody's words! [simpleazon-image align="center" asin="1456350900" locale="us" height="160" src="http://ecx.images-amazon.com/images/I/413w8OVI10L._SL160_.jpg" width="105"] So if you have been hurt, recently or in the past, listen to this pod and deal with it God's way, don't carry it. Your life and your ministry are worth too much! And do not forget, you can actually download a lot of pods without cost either from this site, or it is easy to download without spending a dime from iTunes, or subscribe to it to ensure you don’t miss any episode ever! Nearly every week there's a special edition of the pod coming at you, so subscribe on iTunes and be part of our worship leader community. If you like us, and I hope most of you do, PLEASE LEAVE A REVIEW so iTunes knows that we are helping you along! Whether you're driving to work, mowing the lawn or just chilling out (maybe with a nice cup of tea! ), allow us to teach you, brighten up your entire day and maximize the use of the time you have got for the Lord! Click Here to Subscribe to your Worship Leader Podcast Now! Or type this into your browser: http://www.buzzsprout.com/3378.rss Or, in case you are really keen to understand more about all aspects of worship leading, from managing your team to arranging your songs, from discovering how to worship lead with a small band to conditioning your voice, plus a bunch of other tips and techniques, check out the full list of Worship Leader Podcasts, so you are able to listen to all of them!!! OK, it will take you some time, but you will definitely get some ideas about all aspects of worship leading, how to help your voice, manage your band, and a whole host of other things (and still have one or two laughs). Or, save yourself the trouble and buy the Worship in a Nutshell package, so you are able to get the best information ready to apply right now in the church. It costs a small amount, but boy it saves you a lot of time learning!!! Now sit back and enjoy today's worship leader podcast! This worship leader podcast might just make your life a lot better if you listen to it! We all face them at some stage! Those talented yet difficult people who are hard to manage, always upset about something and generally a pain in the neck. If you do not lead them the correct way, they can make life a complete misery for you and the rest of the team! They can disrupt what you want to do, undermine everything you try to do and turn others against you. They can disrupt practices, upset singers and musicians and even destroy your relationship with the Pastor! They must be managed correctly, and in a Godly manner, and this pod is all about exactly how you can do this! So, if you have a team, don't miss this worship leader podcast! [simpleazon-image align="left" asin="0312152329" locale="us" height="160" src="http://ecx.images-amazon.com/images/I/51DXUEhl2kL._SL160_.jpg" width="107"]Being a worship leader is about leading. I know it is in the name, but it also has to be part of what you do! Leadership is not generally something you are born with, it is something you must develop over time, and anything you can find, from this worship leader podcast to books and teaching on leadership, will be an asset as you try to lead the team. You need to get the best out of them, and also encourage and bless them for their efforts, and this is easier said than done, so please, listen and learn and get some training. You will save yourself a ton of heartache and worry if you can learn some leadership skills! And do not forget, you can still download many pods without spending a dime either from this site, or you'll be able to download at no cost from iTunes, or subscribe to it to make sure you don’t miss any episode ever! Nearly every week there's a special edition of this pod coming at you, so subscribe on iTunes and be a part of our worship leader community. And if you like us, and I hope the majority of you do, PLEASE LEAVE A REVIEW so iTunes knows that we are helping you along! Whether you are driving to work, mowing the lawn or just chilling out (maybe with a nice cup of tea! ), let us teach you, brighten up your day and maximize the use of the time you have for the Lord! Click Here to Subscribe to your Worship Leader Podcast Now! Or type this into your browser: http://www.buzzsprout.com/3378.rss Or, if you're really keen to learn more about all aspects of worship leading, from managing your team to arranging your songs, from discovering how to worship lead with a small band to conditioning your voice, plus a bunch of other tips and techniques, look at the total list of Worship Leader Podcasts, so you are able to listen to all of them!!! OK, it will take you some time, but you will definitely get some ideas about all aspects of worship leading, how to help your voice, manage your band, and a whole host of other things (and have one or two laughs). Or, save yourself the trouble and buy the Worship in a Nutshell package, so you can get the very best information ready to apply right now in the church. It costs a small amount, but boy it saves you plenty of time learning!!! This is definitely a worship leader podcast that affects ALL or us! How do we best manage our time, both for ourselves, our families, our teams, our church and our relationship with God? Hey, I am the first one to put up my hand and say I have trouble getting this bit right, but if you are finding yourself tired, run down, burnt out or just stressed out, this is certainly on of the best pods you will hear! Do you find yourself out too many nights in a week, or do you find large amount of time that you and others commit to practices gets wasted or abused by others? Are you making time for what is really important, or just dealing with the urgent? These and many other questions you might have about time management in your worship leading, and indeed across your whole life, are discussed here in this week's pod. If you cannot find time to listen to this, chances are this is exactly the worship leader podcast for you! It will be fun, slightly crazy and definitely worthwhile, and we even get to welcome back Suzie to the pod, so there is every reason in the world to download and enjoy the Bigger than EVER worship leader podcast! And don't forget, you can download lots of pods for free either from this site, or you can download for free from iTunes, or subscribe to it so you don’t miss any episode ever! Nearly every week there is a special edition of the pod coming at you, so subscribe on iTunes and be a part of our worship leader community. And if you like us, and I hope most of you do, PLEASE LEAVE A REVIEW so iTunes knows that we are helping you along! Whether you are driving to work, mowing the lawn or just chilling out (maybe with a nice cup of tea! ), let us teach you, brighten up your day and maximize the use of the time you have for the Lord! Click Here to Subscribe to the Worship Leader Podcast Now! Or, if you are really keen to learn more about all aspects of worship leading, from managing your team to arranging your songs, from discovering how to worship lead with a small band to conditioning your voice, plus a bunch of other tips and techniques, check out the total list of Worship Leader Podcasts, so you can listen to all of them!!! OK, it will take you a while, but you will definitely get some ideas about all aspects of worship leading, how to help your voice, manage your band, and a whole host of other things (and have a few laughs). Or, save yourself the trouble and buy the Worship in a Nutshell package, so you can get the best information ready to apply right now in your church. It costs a small amount, but boy it saves you a lot of time learning!!! This is a special worship leader podcast, just for you! So kick back, grab a cup of tea or coffee and enjoy a few crazy minutes with the team that always loves and supports you! And don't forget, you can download lots of pods for free either from this site, or you can download for free from itunes, or subscribe to it so you don’t miss any episode ever! Nearly every week there is a special edition of the pod coming at you, so subscribe and be a part of our worship leader community. And if you like us, and I hope most of you do, PLEASE LEAVE A REVIEW so itunes knows that we are helping you along! So, driving to work, mowing the lawn or just chilling out (maybe with a nice cup of tea! ), let us teach you, brighten up your day and maximise the use of the time you have for the Lord! Click Here to Subscribe to the Worship Leader Podcast and Learn How to Worship Lead with Power! Or, if you are really keen to learn more about all aspects of worship leading, from managing your team to arranging your songs, from discovering how to worship lead with a small band to conditioning your voice, plus a bunch of other tips and techniques, check out the total list of Podcasts, so you can listen to all of them!!! Conflict resolution in your worship team, that is what this worship leader podcast is all about. Whereever you have people, you will eventually have conflict and how you handle this can have a huge bearing on how your team leads the congregation in their worship. This worship leader podcast will give you the ability to become a peacemaker in your team, not a pushover! We explore how as leaders we can strong yet loving and fair when we deal with conflict, both between team members or anger directed at ourselves. You may have the perfect band right now, with everybody seemingly happy, but trust me, there will be anger and conflict somewhere along the line, and this podcast will go a long way towards training you to deal with those situations! Oh, and don't forget that you can hear all the latest Worship Leader Podcasts by clicking on the hyperlink and turning up your computer speakers (preferably really LOUD!). You can also download the worship leader podcast for free from itunes AND PLEASE LEAVE A NICE COMMENT ON ITUNES FOR US!, or subscribe to it so you don’t miss any episode ever! So driving to work, mowing the lawn or just chilling out (maybe with a nice cup of coffee! ), let the worship leader podcast teach you and maximise the use of the time you have for the Lord! Click Here to Subscribe to the Worship Leader Podcast! Or, if you are really keen to learn more about all aspects of worship leading, fomr managing your team to arranging your songs and a bunch of other tips and techniques, check out the total list of Worship Leader Podcasts, so you can listen to all of them!!! OK, it will take you a while, but you will definitely get some ideas aboutall aspects of worship leading, how to manage your band, and a whole host of other things (and have a few laughs). Or, save yourself the trouble and buy the Worship in a Nutshell package, so you can get the best information ready to apply right now in your church. It costs a small amount, but boy it saves you a lot of time learning!!! Who is a worship leader and what exactly does he or she do that is different? Many people recognize worship leading as a person standing at the front of a church singing and encouraging others to sing, but as someone who has been leading praise and worship for decades, I believe that our calling is far greater and runs much deeper than mere song leading. Who is a Worship Leader Called to Be? For someone who is a worship leader, the first question is who were you called to be? I believe that the name of the ministry describes what the Lord has called actually us to be… both worshippers and leaders at the same time. Leading worship may seem like you are conducting a sing-a-long, but is this who a worship leader is really called to be? We need to be worshippers ourselves, but we also need to be leaders, leading our congregations and our team members with confidence and power. It is not enough to have a good voice or to play the guitar or piano well. We are called to be leaders, and we must lead our team with humility and strength as well as wisdom and love! We must lead our congregations and our band with true and God centred inspiration, not with heavy handed aggression. Real leaders lead by inspiration, not intimidation, so if we are to truly recognize God’s calling on our lives we have to become the leaders He has called us to be. Who is a Worship Leader Gifted to Be? You see, I believe that when the Lord chooses you and gifts you that He also raises within you the ability to become a leader. Yes, you must follow the Pastor and leadership, but among the team members you need to lead with love and inspiration. So who is a worship leader? It is someone who inspires and encourages their team, and leads them by example into a deeper place of worship. It is someone who seems exalted on stage, but must remain humble and loving at all times. It is someone who has not only the gift of worshipping, but also the gift of leadership. 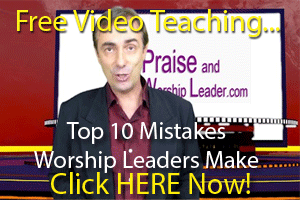 Who Is A Worship Leader! OK, we all have to deal with what this Worship Leader Podcast talks about sometime or other! People!!!! Aaarrgh! If you are worship leading, then you will have to deal with all sorts of people who present all sorts of problems, so if you have a team, this worship leader podcast is most definitely compulsory listening! Forgiving and releasing worship team members back into the team can be a touchy subject, especially when what they have done has caused a great deal of damage or offence. But this must be our aim, when any of our worship team has fallen for whatever reason. We are not there to punish, condemn and chastise, we are leading our teams to restore and forgive, but at times this is hard especially when the offence has affected other members of the team deeply. So how do you balance the damage done with the desire of forgiving and releasing team members? That’s what this week’s pod is discussing. And as you will hear, there is not always a stable point of view in all this. It is something you need to seek the Lord on and look to His leading and guidance when it comes to forgiving and releasing people back into ministry. And don’t forget, we have an amazing worship leader training academy which is available to you a a fraction of the cost of going to Bible College. It is a complete 6 month course covering everything you need to know to lead a worship team, from choosing the right songs, joining and arranging songs and going up keys, right through to management of the team, dealing with personalities, conflicts, encouragement and everything else. So if you are leading worship in any capacity, don’t stumble in the dark! For just $29.77 a month get the training you need to not just get by, but become the worship leader you are destined to be. Supercharge your worship leading abilities today (maybe even get your church to sponsor you… best investment they could ever make!). This worship leader podcast is exactly what you need if you want to create the perfect backing band to lead worship with. Wouldn’t you like the best band ever behind your worship leading? I know I would, but the pod today discusses what exactly is the perfect band, and the steps you need to take to create it in your church. Is having the perfect band behind you about their abilities, their attitudes, your leadership or the grace of the Holy Spirit? It is probably a bit of all of these, but in the pod we will show you which ones you can compromise on, and which ones are the most important (starting obviously with the Holy Spirit!). And don’t forget, it is possible to download lots of pods for free either from this site, or you are able to download free of charge from iTunes, or subscribe to it so you don’t miss any episode ever! Nearly every week there is a special edition of the pod coming at you, so subscribe on iTunes and be a part of our worship leader community. And if you like us, and I hope many of you do, PLEASE LEAVE A REVIEW so iTunes knows that we’re helping you along! Whether you are driving to work, mowing the lawn or simply chilling out (maybe with a pleasant cup of tea! ), let us teach you, brighten up your entire day and maximize the use of the time you have for the Lord! Click Here to Subscribe to your Worship Leader Podcast Now! Or, should you be really keen to master more about all aspects of worship leading, from managing your team to arranging your songs, from discovering how to worship lead with a small band to conditioning your voice, plus a bunch of other tips and techniques, take a look at the whole list of Worship Leader Podcasts, so you can listen to all of them!!! OK, it will take you a while, but you will definitely get some ideas about all aspects of worship leading, how to help your voice, manage your band, and a whole host of other things (and also have one or two laughs). Or, save yourself the trouble and buy the Worship in a Nutshell package, to help you get the best information ready to apply now in the church. It costs a small amount, but boy it saves you quite a lot of time learning!!! This worship leader podcast is on a touchy subject, yet it is something you will face sometime for sure… harsh words! It might be anger from a team member, it might be criticism from a congregation member or it might be something said harshly by your senior pastor. Doesn’t matter, they all hurt like crazy and can destroy you, your confidence and your ministry if you don’t deal with them the right way! No one likes to be criticized, and no one likes to be spoken to harshly. But it will happen, so get prepared. The old saying says, “Sticks and stones may break my bones but words will never hurt me,” and it is simply not true. Words can hurt you far more than sticks and stones, and the scars can last a lifetime! You cannot stop the harsh words, but what you can do it protect yourself against their venom and make sure that, while they may still hurt, you are not destroyed by them! Your ministry before the Lord is too precious to have it destroyed by somebody’s words! So if you have been hurt, recently or in the past, listen to this pod and deal with it God’s way, don’t carry it. Your life and your ministry are worth too much! And do not forget, you can actually download a lot of pods without cost either from this site, or it is easy to download without spending a dime from iTunes, or subscribe to it to ensure you don’t miss any episode ever! Nearly every week there’s a special edition of the pod coming at you, so subscribe on iTunes and be part of our worship leader community. If you like us, and I hope most of you do, PLEASE LEAVE A REVIEW so iTunes knows that we are helping you along! Whether you’re driving to work, mowing the lawn or just chilling out (maybe with a nice cup of tea! ), allow us to teach you, brighten up your entire day and maximize the use of the time you have got for the Lord! Or, in case you are really keen to understand more about all aspects of worship leading, from managing your team to arranging your songs, from discovering how to worship lead with a small band to conditioning your voice, plus a bunch of other tips and techniques, check out the full list of Worship Leader Podcasts, so you are able to listen to all of them!!! OK, it will take you some time, but you will definitely get some ideas about all aspects of worship leading, how to help your voice, manage your band, and a whole host of other things (and still have one or two laughs). Or, save yourself the trouble and buy the Worship in a Nutshell package, so you are able to get the best information ready to apply right now in the church. It costs a small amount, but boy it saves you a lot of time learning!!! Now sit back and enjoy today’s worship leader podcast! This worship leader podcast might just make your life a lot better if you listen to it! We all face them at some stage! Those talented yet difficult people who are hard to manage, always upset about something and generally a pain in the neck. If you do not lead them the correct way, they can make life a complete misery for you and the rest of the team! They can disrupt what you want to do, undermine everything you try to do and turn others against you. They can disrupt practices, upset singers and musicians and even destroy your relationship with the Pastor! They must be managed correctly, and in a Godly manner, and this pod is all about exactly how you can do this! So, if you have a team, don’t miss this worship leader podcast! [simpleazon-image align=”left” asin=”0312152329″ locale=”us” height=”160″ src=”http://ecx.images-amazon.com/images/I/51DXUEhl2kL._SL160_.jpg” width=”107″]Being a worship leader is about leading. I know it is in the name, but it also has to be part of what you do! Leadership is not generally something you are born with, it is something you must develop over time, and anything you can find, from this worship leader podcast to books and teaching on leadership, will be an asset as you try to lead the team. You need to get the best out of them, and also encourage and bless them for their efforts, and this is easier said than done, so please, listen and learn and get some training. You will save yourself a ton of heartache and worry if you can learn some leadership skills! And do not forget, you can still download many pods without spending a dime either from this site, or you’ll be able to download at no cost from iTunes, or subscribe to it to make sure you don’t miss any episode ever! Nearly every week there’s a special edition of this pod coming at you, so subscribe on iTunes and be a part of our worship leader community. And if you like us, and I hope the majority of you do, PLEASE LEAVE A REVIEW so iTunes knows that we are helping you along! Whether you are driving to work, mowing the lawn or just chilling out (maybe with a nice cup of tea! ), let us teach you, brighten up your day and maximize the use of the time you have for the Lord! Or, if you’re really keen to learn more about all aspects of worship leading, from managing your team to arranging your songs, from discovering how to worship lead with a small band to conditioning your voice, plus a bunch of other tips and techniques, look at the total list of Worship Leader Podcasts, so you are able to listen to all of them!!! OK, it will take you some time, but you will definitely get some ideas about all aspects of worship leading, how to help your voice, manage your band, and a whole host of other things (and have one or two laughs). Or, save yourself the trouble and buy the Worship in a Nutshell package, so you can get the very best information ready to apply right now in the church. It costs a small amount, but boy it saves you plenty of time learning!!! This is definitely a worship leader podcast that affects ALL or us! How do we best manage our time, both for ourselves, our families, our teams, our church and our relationship with God? Hey, I am the first one to put up my hand and say I have trouble getting this bit right, but if you are finding yourself tired, run down, burnt out or just stressed out, this is certainly on of the best pods you will hear! Do you find yourself out too many nights in a week, or do you find large amount of time that you and others commit to practices gets wasted or abused by others? Are you making time for what is really important, or just dealing with the urgent? These and many other questions you might have about time management in your worship leading, and indeed across your whole life, are discussed here in this week’s pod. If you cannot find time to listen to this, chances are this is exactly the worship leader podcast for you! It will be fun, slightly crazy and definitely worthwhile, and we even get to welcome back Suzie to the pod, so there is every reason in the world to download and enjoy the Bigger than EVER worship leader podcast! And don’t forget, you can download lots of pods for free either from this site, or you can download for free from iTunes, or subscribe to it so you don’t miss any episode ever! Nearly every week there is a special edition of the pod coming at you, so subscribe on iTunes and be a part of our worship leader community. And if you like us, and I hope most of you do, PLEASE LEAVE A REVIEW so iTunes knows that we are helping you along! Whether you are driving to work, mowing the lawn or just chilling out (maybe with a nice cup of tea! ), let us teach you, brighten up your day and maximize the use of the time you have for the Lord! This worship leader podcast talks about how you cope with not being the main worship leader, yet still wanting to bring influence to the worship. This is going to happen to us all, and sometimes you can feel so powerless when you are just a singer or musician, you can see the way things are going, but you seem totally powerless to change things. Many of our listeners are not the main worship leader for their church, and so the pod team wanted to produce a podcast that was extra special, just for them. In it we share ideas on how you can serve faithfully, yet still bring influence to the worship. We discuss how you can gently and lovingly make suggestions, without undermining or inciting rebellion in your worship team. Just because you are not the main leader for the day, or of the entire show in your church, does not mean that you have to simply follow orders and contribute nothing. Hey, serving the Lord is the main aim of our worship leading, whether we are setting the pace or providing support. It is all about Him, not about us and our desires, wants or ideas. So kick back, grab a cup of tea or coffee and enjoy a few crazy minutes with the team that always loves and supports you! And don’t forget, you can download lots of pods for free either from this site, or you can download for free from itunes, or subscribe to it so you don’t miss any episode ever! Nearly every week there is a special edition of the pod coming at you, so subscribe and be a part of our worship leader community. And if you like us, and I hope most of you do, PLEASE LEAVE A REVIEW so itunes knows that we are helping you along! So, driving to work, mowing the lawn or just chilling out (maybe with a nice cup of tea! ), let us teach you, brighten up your day and maximise the use of the time you have for the Lord! This worship leader podcast will give you the ability to become a peacemaker in your team, not a pushover! We explore how as leaders we can strong yet loving and fair when we deal with conflict, both between team members or anger directed at ourselves. You may have the perfect band right now, with everybody seemingly happy, but trust me, there will be anger and conflict somewhere along the line, and this podcast will go a long way towards training you to deal with those situations! Oh, and don’t forget that you can hear all the latest Worship Leader Podcasts by clicking on the hyperlink and turning up your computer speakers (preferably really LOUD!). You can also download the worship leader podcast for free from itunes AND PLEASE LEAVE A NICE COMMENT ON ITUNES FOR US!, or subscribe to it so you don’t miss any episode ever! So driving to work, mowing the lawn or just chilling out (maybe with a nice cup of coffee! ), let the worship leader podcast teach you and maximise the use of the time you have for the Lord! Who is a Worship Leader Really Supposed to Be? For someone who is a worship leader, the first question is who were you called to be? I believe that the name of the ministry describes what the Lord has called actually us to be… both worshippers and leaders at the same time. Leading worship may seem like you are conducting a sing-a-long, but is this who a worship leader is really called to be? We need to be worshippers ourselves, but we also need to be leaders, leading our congregations and our team members with confidence and power. It is not enough to have a good voice or to play the guitar or piano well. We are called to be leaders, and we must lead our team with humility and strength as well as wisdom and love! We must lead our congregations and our band with true and God centred inspiration, not with heavy handed aggression. Real leaders lead by inspiration, not intimidation, so if we are to truly recognize God’s calling on our lives we have to become the leaders He has called us to be. You see, I believe that when the Lord chooses you and gifts you that He also raises within you the ability to become a leader. Yes, you must follow the Pastor and leadership, but among the team members you need to lead with love and inspiration. So who is a worship leader? It is someone who inspires and encourages their team, and leads them by example into a deeper place of worship. It is someone who seems exalted on stage, but must remain humble and loving at all times. It is someone who has not only the gift of worshipping, but also the gift of leadership. A worship leader is someone who leads worship in church, but in reality they are a true and inspiring leader of people, both in their team and in their church. For this reason, someone who is a worship leader must be also a servant, totally available and always humbling doing whatever they can to bless those around them. Those who lead worship are not stars, they are not heroes. No, we are simply servants with a peculiar gifting. We need to love, we need to inspire and we need to work hard at our chosen profession, and if we do so faithfully I believe we will have the joy of seeing many people’s lives inspired and blessed, not only by our music by even more by our lives and leadership.